FROM ONLY £4.99 !!! - SIZES 8-24 - GREAT VALUE !!! 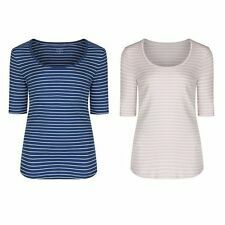 This is a Marks and Spencer pure cotton top from the Indigo range in size 10. The top and sleeves are cotton jersey, and the lower trim is cotton lace. It's machine washable at 40 degrees, and there is a spare button attached. Ladies Marks & Spencer White linen long sleeved blouse size 14 with turn back sleeves & front pockets. This is a lovely shirt/blouse from Marks and Spencer in a size 10. It has a small collar, long, adjustable sleeves, a front button fastening and two front pockets. 19" across chest laid flat and 25" from the back of the neck to the hem. M&S Womens Green Linen Shirt Size 10. Condition is Used. Dispatched with Royal Mail 2nd Class. 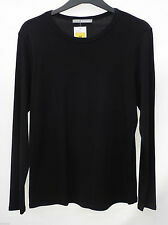 Ladies Off The Shoulder Top Navy Blue Eith Embroidered Sleeves Marks And Spencer. Condition is Used. Dispatched with Royal Mail 2nd Class. M&S Collection Blouse in soft pale blue with romantic full adjustable ruched sleeves, in excellent condition never worn but tags removed and tried on. "LIMITED EDITION" MULTI COLOURED TOP - 100% VISCOSE.